Wednesday March 3, 2010 was a day in which those present showed their affection with one hundred percent of their values with gestures of solidarity. 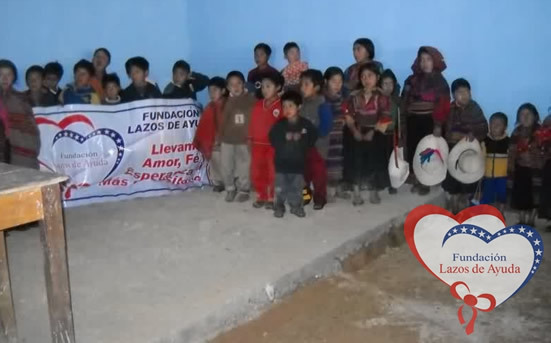 Supporting with the funds obtained in the Peruvian breakfast, to the purchase of all delivered materials, organized by the Lazos de Ayuda Foundation. Green is a color of hope, of faith to direct oneself on the good path of progress, approaching God and in Sinchiwal the green to the natural is what predominates in all its beautiful landscapes. Using Quechua as the main language of this town. It is a two hour walk to Incahuasi, the Sinchiwal Hamlet is located in a mountainous area with many precarious houses where the security conditions are not the most adequate, but nevertheless there are their homes and nature has given them space for agricultural fields that are installed on the hillsides. Exercising faith in Jesus is what God has offered us as a possibility to live to do good by transmitting with these facts the confidence to succeed that many people need, being tomorrow later rewarded in heaven with the heavenly kingdom of the Lord. Therefore, there is no effort in vain that is done for the good and in this case of the homeless. A total of 37 children from initial, 77 from the 1st to 6th grade and 15 from the 1st year of secondary school were the beneficiaries of the donation. Participated with his active presence, the director of the school, Professor Martín Sánchez Purihuamán, as well as the lieutenant governor Mr. Evaristo Manayay Sánchez and the President of the APAFA Mr. Ambrosio Manayay Sánchez. Also, some parents came, since several were working in the field. The audio equipment, was operated by the treasurer of the APAFA Mr. Tomás Sánchez, which we appreciated, since the children enjoyed the artistic show. They were amazed as the majority of were observing for the first time the clowns who played diverse games and different contests rewarding to the winners with notebooks, colors, rules, etc. All sang, played and performed their typical dances, many of them with their ojotas (Handmade Sandals), spending a beautiful day with the overflowing joy of children. At the end of the artistic show, we began to deliver a complete school uniforms, sweaters with school badges, pants, skirts, shirts and blouses plus school supplies with backpacks, intended for children from 1st grade to 6th grade and those of 1st year of secondary School. A feeling of affection radiated with the gratitude from the authorities of the hamlet and the director of the educational center adding that of the parents who could not find more words of gratitude for what they had received. Perhaps the most heartfelt were said by the President of APAFA, Mr. Manayay: "I would have felt more motivated to study if I had counted on these incentives in my school days". Likewise, the Director of the school, Mr. Martín Sánchez, spare words of gratitude for the help received that will serve much for the educational development of Sinchiwal's children. As a final act in the farewell to appreciate those tender children dressed in their uniforms and a smile of gratitude showing their tools, only motivates us to continue with the firm mission of getting more resources to use them for the good of others. We will be with open arms to receive your selfless contribution, always collaborating with the most needy, being a bridge to reach them. We will greatly appreciate your active presence, adding to those who in a labor of love can give their valuable time to children, offering their work at no cost to the Foundation, nor expecting a stipend from it, because there is nothing more beautiful than giving and only receive a spiritual payment from the Almighty. Many thanks to all, although the distance of kilometers is considerable, it is not an impediment to continue helping and feel that feeling that only harbors the soul with a heart swollen with love and full of happiness to reach out to the most destitute. The professionals in the field who accompanied us on this occasion were in General Medicine Dr. José Terry CMP 56984, in Pediatrics Dr. Víctor Burga CMP 18809, Dr. Verónica Vallejos CMP 54451 in Gynecology, a Lic. In Nursing and a Nursing technician. The Health Campaign was made possible thanks to the Great Family Anticuchada Event on Saturday, June 19, held in the City of Atlanta. 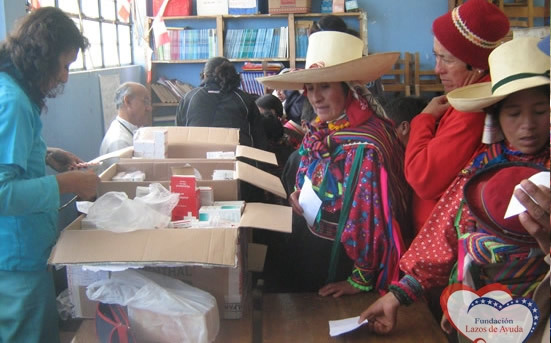 Nearly 300 Quechua speakers among children and adults, that is to say almost the entire population of Sinchiwal, received medical attention in the Health Campaign carried out on July 24 and 25 by the Lazos de Ayuda Foundation. In the community of Sinchiwal, located in the district of Incahuasi, in the Ferreñafe province, located in the department of Lambayeque in northern Peru, at more than 3,200 meters above sea level. With the inclemency of the climate and the limitations in terms of amenities, we still fulfilled our mission. In an environment enabled two different spaces, one for general medical care, pediatrics and a pharmacy, and the other for care in gynecology. People approached from different fields and were immediately taken care of by the technique that instantly generated an admission report where all the patient's data was recorded. The report in General Medicine by Dr. José Terry CMP 56984, when evaluating patients reported that the population mostly suffered from purulent pharyngitis, cough with phlegm. Also, many people presented dermatological problems with allergies and fungi in the skin, as well as problems in the ear and dental presented across most people. Regarding the back pain, pain in the lower back was another case that prevailed among the residents, because in many cases they carry their children and the wood on their backs. Another of the disadvantages found, although in a smaller amount in affected male patients, were related to the urinary tract and joint problems. In Pediatrics Dr. Víctor Burga CMP 18809 indicated that the most common diseases found in children were intestinal, respiratory and skin-related parasites. It was also observed cases of moderate mild malnutrition, mainly due to intestinal parasitosis and its carbohydrate-based diet. The doctor also noted the consumption of soft drinks of dubious origin created issues. Dr. Verónica Vallejos CMP 54451 specialist in Gynecology received in consultation approximately 100 women between 13 and 70 years of age. The results showed urinary tract infections and vaginosis, puerperal infection, as well as pharyngitis and acute bronchitis in the diagnoses. The issue to fight in general is the parasitosis in the population. Everyone received the medicines recommended by the doctors at the pharmacy free of charge. When there was a remnant of medicines from the boxes that were taken away, it was decided with the presence of Lieutenant Governor Mr. Evaristo Manayay, to give them a lot to implement the kit of the Sinchiwal farmhouse. 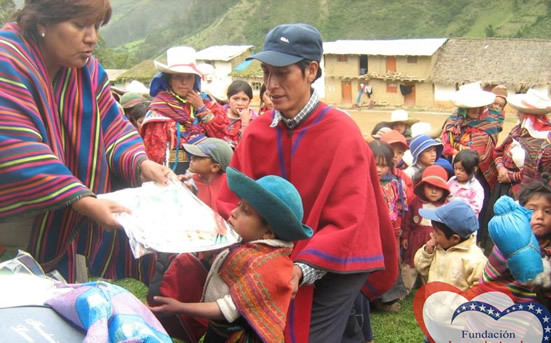 A talk was given on the most relevant topics in health, such as family planning, the prevention of acute diarrheal diseases and acute respiratory infections, translated into Quechua in real time for understanding. The commitment of help acquired by the Foundation generated the support of many people, with the need also to reward with a stipend the medical professionals who accompanied us in this task, including a nurse and a technician. With the firm idea of being able to combat the cold, the foundation also delivered polar blankets and stockings for the entire population. Also, the Mother Superior and the Missionary Mothers of Jesus Verb and Victim, received a donation of medicines, for the most needy. Several volunteers joined. But as every work of God is followed by many, we must highlight the selfless gesture of many volunteers who joined the foundation and contributed their work, united and delivered to a single mission, to help. As a seed to sow and a later harvest all the love is being linked, as a paradigm of good on the part of adults towards children. Thank you, Christ, for transmitting that heavenly strength and being able to continue on that path to collect and receive donations from many kind, just and true human beings for being close to God and helping the helpless. .
Haircut for the children of the Sinchiwal Hamlet in Incahuasi, Lambayeque, Peru – September 2010. A free haircut was performed in the presence of the people, all the enthusiastic children of the school SINCHIWAL 10092. Dressed in their clothing, the town joined also, for a propitious day for smiles and greetings; with a heart so open to receive the Lord and thank him for everything, aware of the needs they have and for that love of neighbor derived from God with that wonderful and great affection for their fellow.. Successful Eucharistic Day in the Hamlet of Sinchiwal, Incahuasi, Lambayeque, Peru – September 2010. Nothing more beautiful than to give ourselves to the Lord. Praising God in the village of Sinchiwal, a Eucharistic meeting was held. A hopeful visit with the ingredient of LOVE so fundamental happens all our acts of life, lived in Sinchiwal on Sunday, September 5,2010; approaching God, our creator, to have him always present in our thoughts.. The Foundation lived again a spiritual journey, being the reason for meeting in this village with a Eucharistic event offered by the participation of the Missionary Mothers of Jesus, verb and victim, that with their collaboration working their lives in extreme poverty, without giving up the affection and attention to the most needy. They brought us the word of God, transmitting that living faith, that way in which the Lord guides us like a star ready to illuminate the most needy. The Foundation was also in charge of the charismatic praises, with songs dedicated to the Creator, gathered together as brothers, as children of God who bless the Lord, find echo in all those present. The happiness was around by the presence of the children of the Sinchiwal hamlet, as well as the authorities and the whole population in general. In the month of October, the purple month, to draw closer to God, love again appeared. Looking at the sky as they approached the Lord, and on earth a whole crowd walked the step of the Lord of Miracles with all the joy as Christ who radiated and transmitted love and peace. 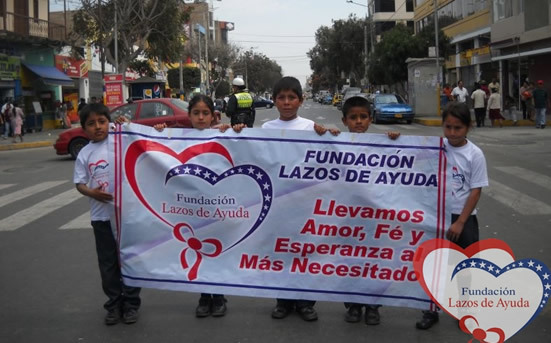 Lazos de Ayuda Foundation received invitations as a deference for the altruistic work of uniting people with the message of love of the Almighty, being able to participate in three seasons in the departures of the Lord of Miracles, in three tours that served to pour out Many doses of love to the most needy. There is nothing more sublime, more beautiful, in the life of a person, than to help others protect and transmit that love of God, because the Lord cares for those he loves and hears his voice. Therefore, the departure of the Lord of Miracles was carried out in three processional tours framed by stations . In each of the five hamlets the hot chocolate was prepared by the volunteers of Lazos de Ayuda with the valuable collaboration of the mothers of each population who were always ready to cooperate participating actively, in a sublime moment. They breathed an atmosphere of peace, harmony, kindness, and generosity complemented the blessed word that contains all the feelings that bind one person to another, that we will not tire of reiterating it, LOVE. Christmas is for children and for those who believe in God. Since we all have the soul of children, not only the little ones enjoyed this approach to the baby Jesus. It was a great surprise when a volunteer of Lazos de Ayuda appeared dressed as Santa Claus riding a donkey, preparing everything that was after the delivery of toys. 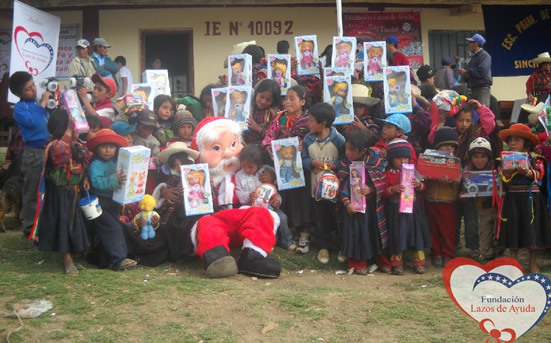 With a joy that enlivened the children, for example in Janque, they were given toys according to their age and gender. In that same land the mothers officiated a mass, in connection with Jesus, uniting us with the man, who for love gave his life and then rose again. At the singing of the carols played by the children's choir, they were welcomed by Lazos de Ayuda. They were two intense days with a lot of enthusiasm giving joys to those children of the five villages that unite them the innocence and the most pressing needs for their development as a person. Thanks to all the brothers of God. We could not ignore the gratitude to various institutions and people who disinterestedly without any benefit, but only to feel gratified of life to be fully useful to help, offer support for the activities being carried out. To the mothers "MISSIONARY MOTHERS OF JESUS VERBO AND VICTIM" with the superior mother Priscilla of the order of Incahuasi, they assigned two nuns who accompanied us on the tours.Thanks for always, in the Foundation we greatly appreciate your assistance, because they are willing to contribute to the collaborators, always indefatigable with that strength and power coming from God. 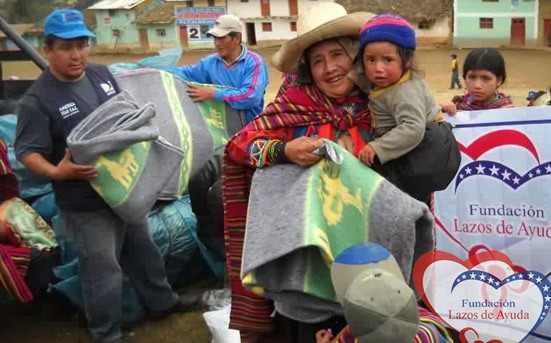 A gratitude and eternal recognition to the Peruvian sponsors, for that solidarity delivery, that without any obligation they carry out in favor of the needy. To the Peruvian, Hispanic community and to the Americans a huge gratitude for joining this noble cause of Help Laws. The children of the five mentioned villages of Incahuasi with that Christmas message and that happiness of their ages, thank you for remembering them. Praesent diam massa, interdum quis ex id, laoreet interdum odio. founded by Mrs. Maritza Castro on 21 February 2008 in the state of Georgia, USA, is a non-profit organization. The foundation, for nine years has been working non-stop daily in order to build programs, aid and support for children and communities of Peru with the greatest needs..
P.O. BOX 464358 Lawrenceville, Georgia 30042. Copyright 2017. All Rights Reserved by FUNDACION LAZOS DE AYUDA. Designed by DATA SOLUTION.